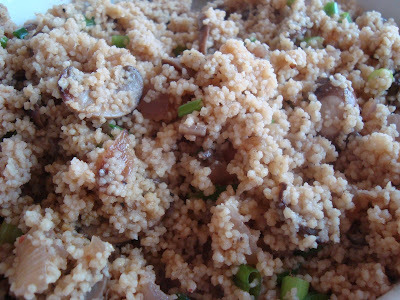 Sometimes couscous can be pretty bland and it could use some seasoning to flavor it up. Aside from using broth to cook the couscous, I like adding chopped vegetables which have been caramelized to give it an additional depth of flavor. 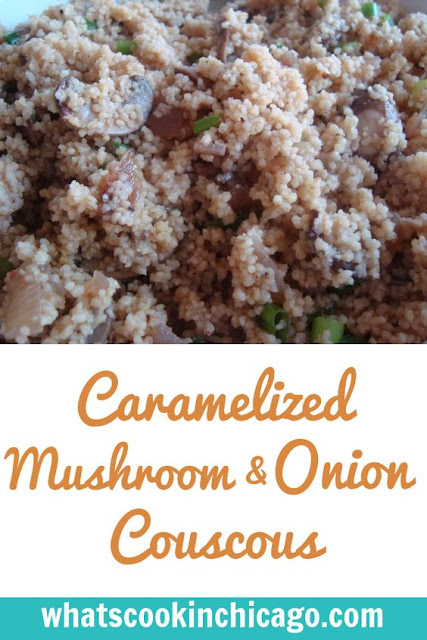 Mushrooms and onions are wonderful caramelized and are even better when combined with couscous. I prepared the following as a side dish for dinner tonight and it paired with my pecan crusted chicken nicely. In a medium sauce pan, add the chicken broth and bring to a boil. In a medium skillet over medium high heat, heat the oil until hot. Add the onion, garlic and mushrooms and saute until softened. Continue to cook until mushrooms begin to caramelized. Remove from heat and add to the saucepan of chicken broth. Add the dry couscous to the saucepan of chicken broth; stir, cover and set aside. After 10 minutes, remove the cover and stir to ensure all the liquid has been absorbed. Season with salt and pepper to taste. Stir in the sliced green onions before serving.